Four years since winning its first Worst Company tournament, Comcast’s doubted that the Kabletown Krusher could ever regain that 2010 form. 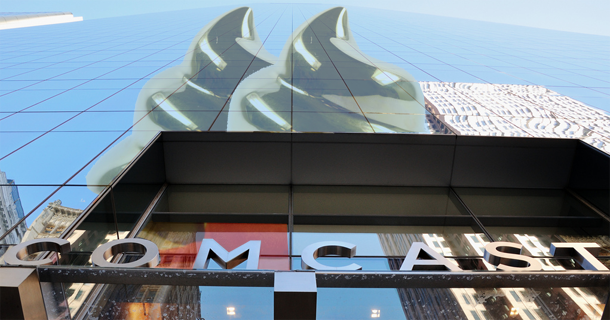 But after a few years of letting others hold the title, Comcast was fiercely intent on bringing a second Golden Poo to its Philadelphia lair. 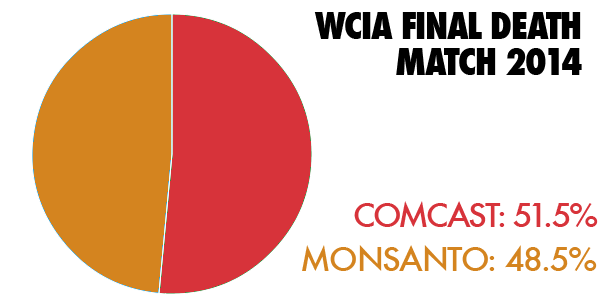 And in one of the narrowest Final Death Matches in the centuries’ long history of WCIA battle, Comcast managed to hold the genetically modified body blows of Monsanto. From the onset of the day-long bout, lawsuit-lovin’, herbicide-makin’ Monsanto was within striking distance of the Philly Kid, but Comcast gained a hair-thin edge early on and never ceded the lead. Comcast’s road to the Poo started out without a speedbump, as the company powered through the first three rounds without ever giving up more than 30% of the vote. And with two-time reigning champ EA eliminated in Round One by Comcast’s merger partner Time Warner Cable, followed by three-time consecutive runner-up Bank of America’s surprise defeat at the hands of Walmart, Comcast seemed destined for the Final Death Match. But the nation’s largest cable and Internet provider (which is trying to become even larger), almost got stopped in its track by first-time contender SeaWorld, riding high on waves of negative publicity tied to the documentary Blackfish. Comcast pulled off a buzzer-beater to hold off SeaWorld and earn its place in the Final Death Match. Comcast’s win makes it only the second company to claim multiple Poos. Last year, video game biggie EA was both the first two-time winner and its first repeat champ. And so that’s it for WCIA 2014. See you again next year!